Having passed the half-time point of this trip, it was time to return southbound. 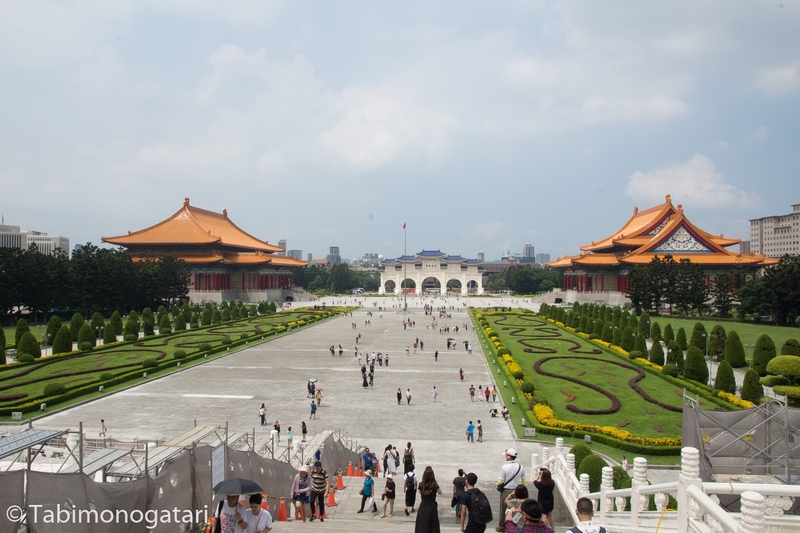 The next destination is Taipei, the capital of the island Taiwan, who considers itself a sovereign state but is governed by China. The political situation is not simple to explain, so will not attempt to do so and refer the reader to another source. 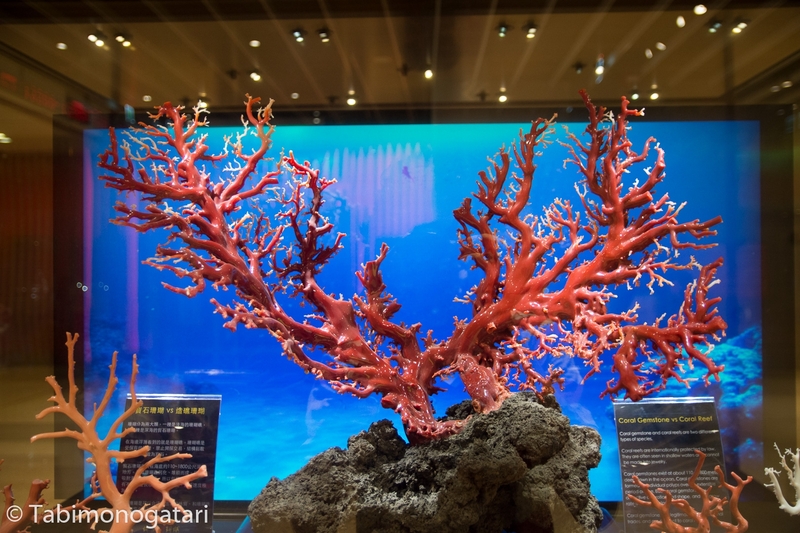 What is without question is the rich cultural and culinary heritage of the country, having borrowed from China and Japan over the centuries. 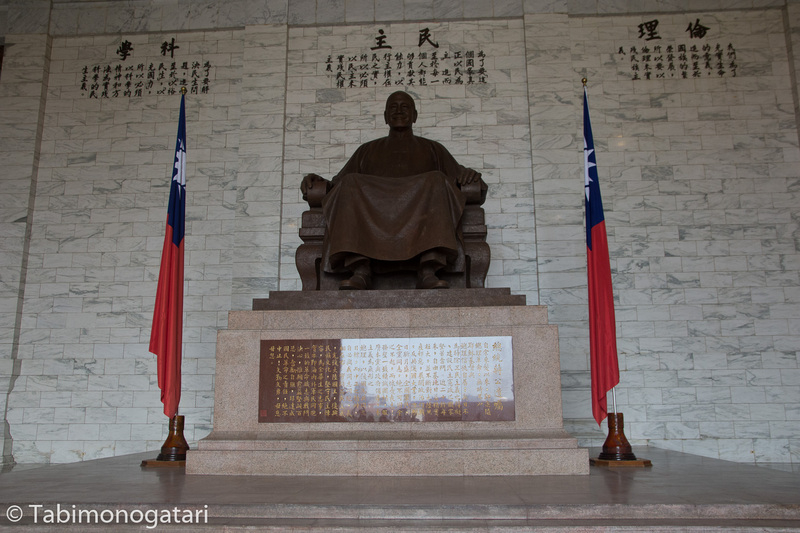 The spoken language here is Mandarin (Chinese) and Taiwan has its own currency. Motorbikes were much more abundant than elsewhere I noticed but cars still dominated the streets. 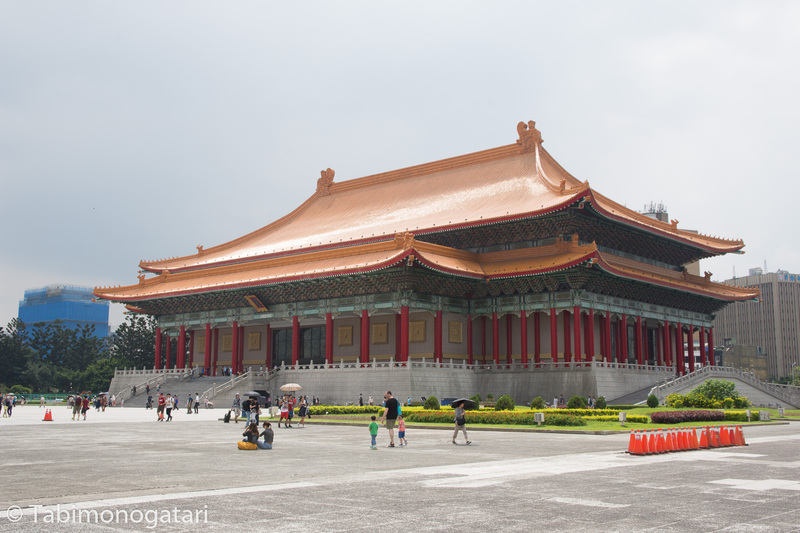 Taipei, the capital of the island, has its own international airport that lies outside the city in the West. The airport express train transported me to the main station in about half an hour where the hostel I was staying at was situated. 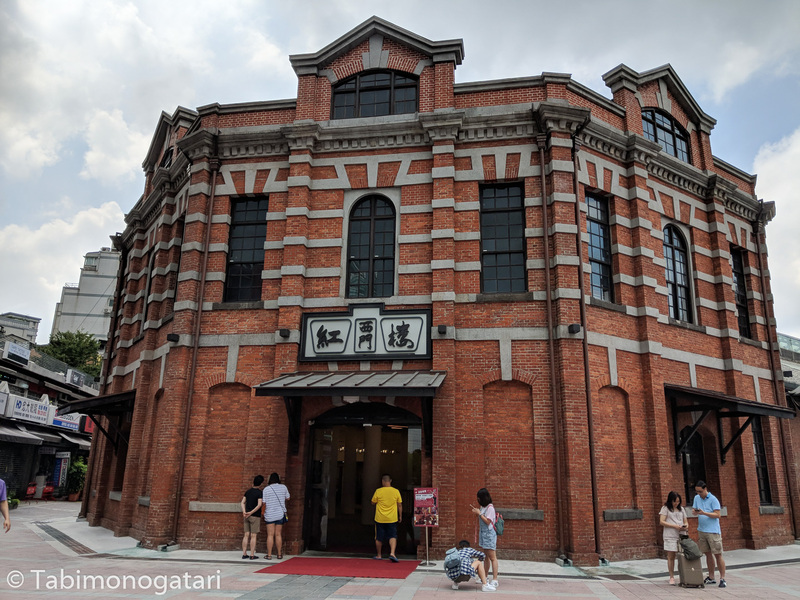 It was evening when I arrived at the hostel, but it was incredibly hot outside nonetheless. 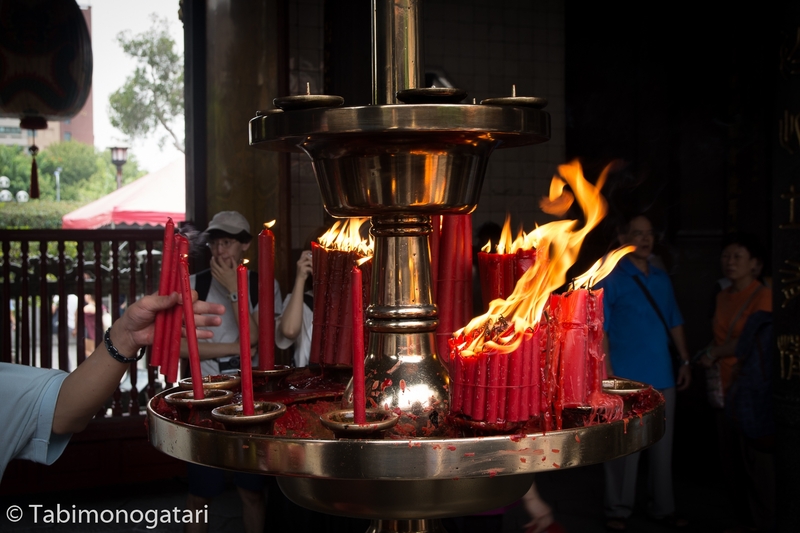 The climate here is very hot and humid, but inside the A/C was running. The hostel was not only conveniently located, the rooms and the common areas were spacious and the English-speaking staff was helpful, too. 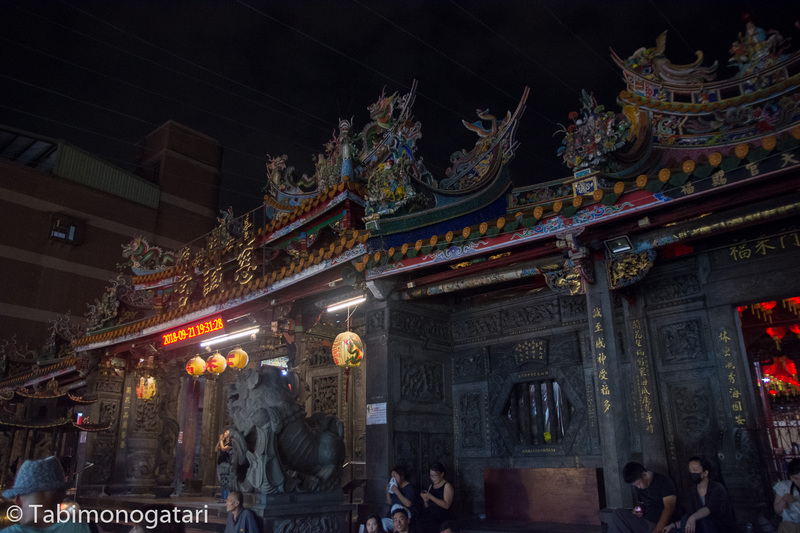 The night markets are one of Taipei’s top attractions and there is not just one, there is one in every district of the city it seems. 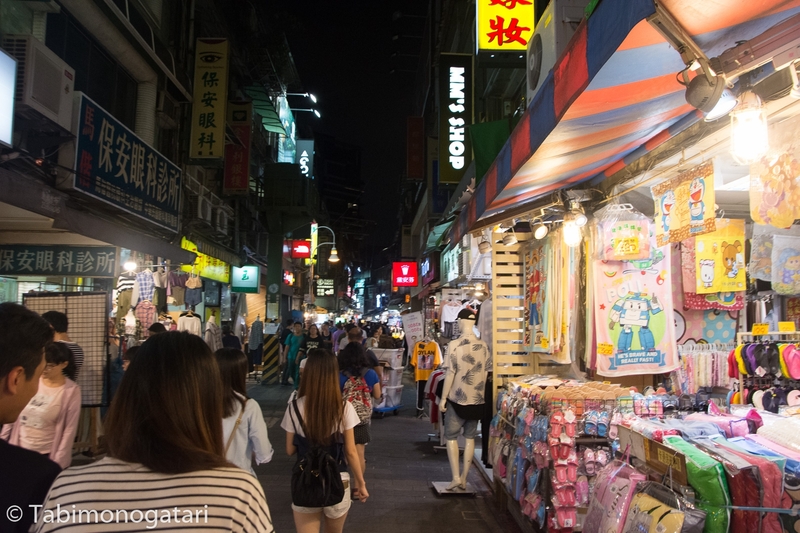 The most frequented one must be the Shilin night market where I went to try some local treats. The streets were full of people and some stalls had queues of such lengths that they sometimes blocked the adjacent stalls and the narrow street. My culinary journey encompassed bacon-wrapped green sprouts, boba milk tea (you might know it as bubble tea with Tapioca spheres), cha siu bao (pork bun), brick oven-baked buns and grilled mushrooms. 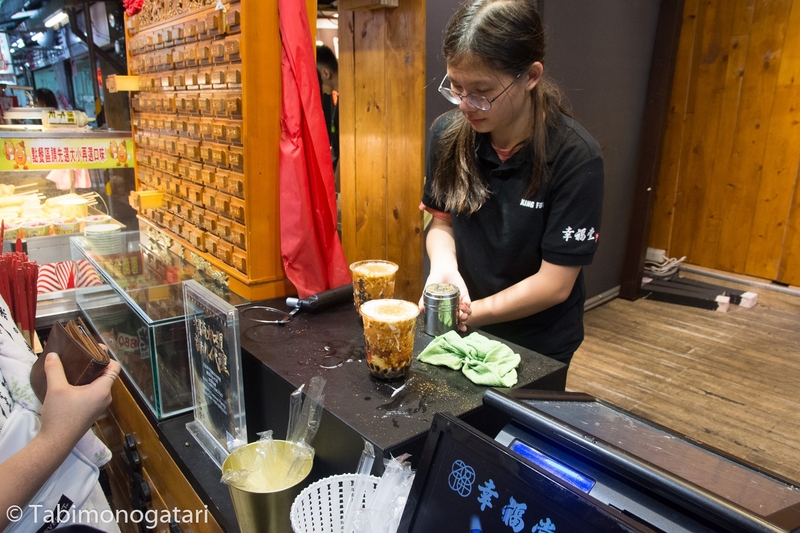 Speaking of said tea, the sweet milk tea with tapioca pearls was invented here in Taiwan and had a popularity surge in Europe a few years back. 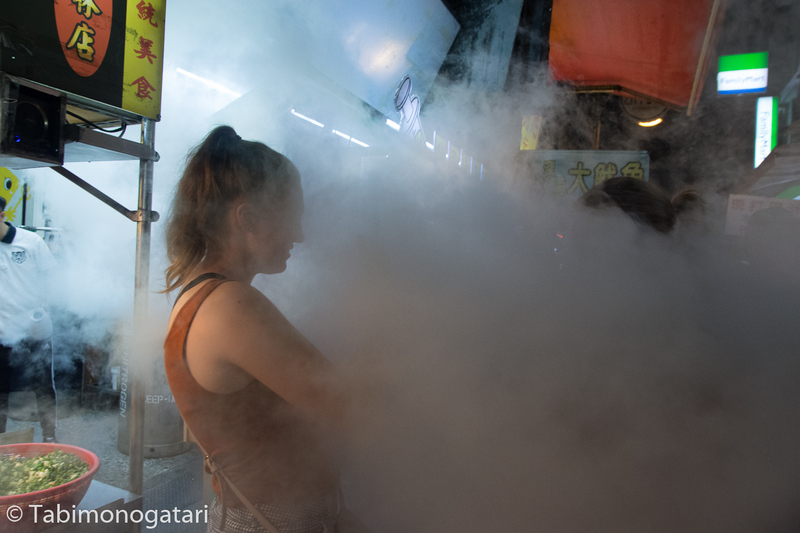 A stall selling nitrogen-cooled ice cream was also quite popular. 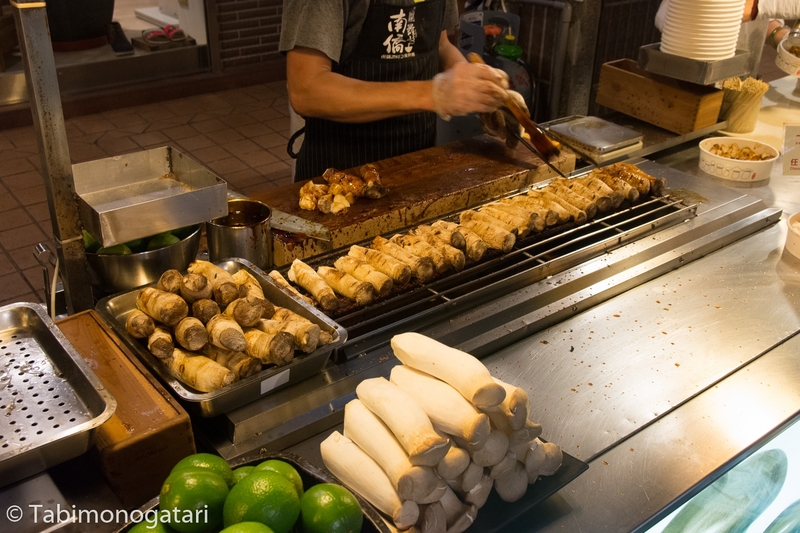 There are many more Taiwanese specialties to try, to example oyster omelets, Taiwanese sausages and the controversial stinky tofu. 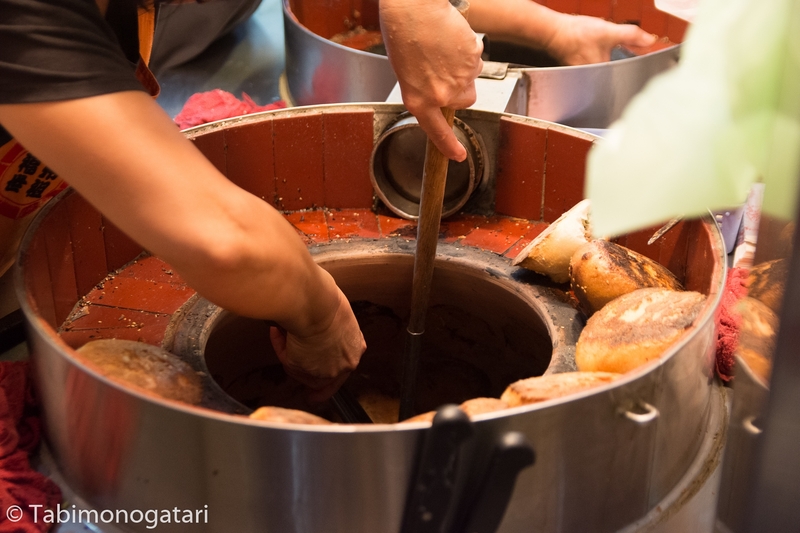 The scent of the dish was so intense that I could smell it from several meters away. I have not tried it but to be blunt, the smell is unpleasant. 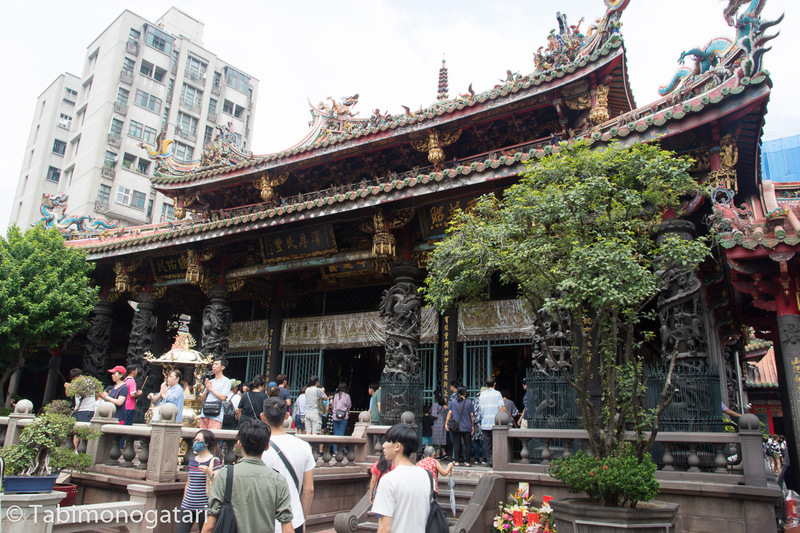 The next day I had breakfast at the hostel and then took the MRT to Longshan Temple, an impressive Buddhist temple that also includes some Taoist elements. 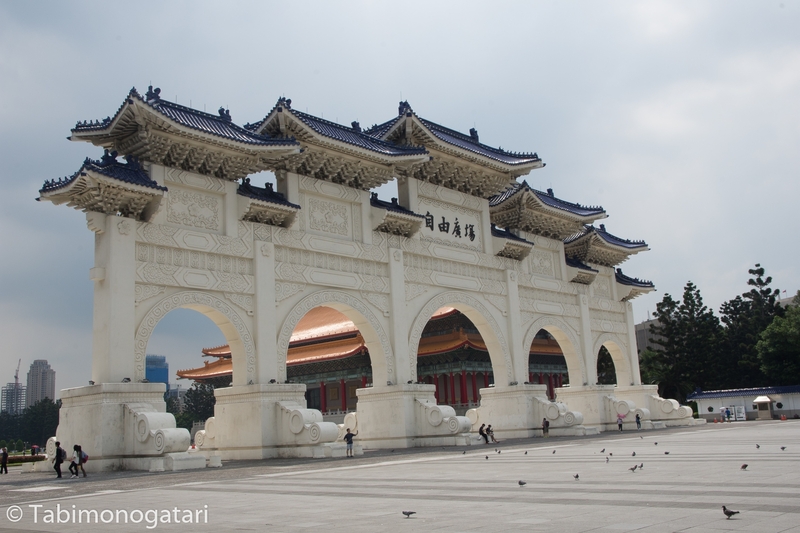 With a bus it was a short journey to the Sun Yat-sen Memory Hall, a huge memorial of the founder of the Republic of China. 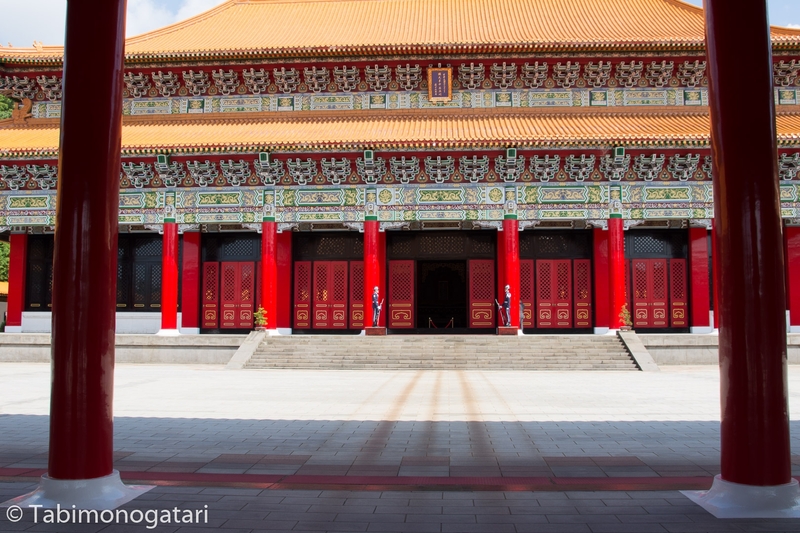 The alley leading up to it was impressive on its own with a large gate and two theaters. At every full hour a change of guards takes place. I did not have the patience to watch it and headed on to the East end of the city instead. The weather forecast predicted rain for the day but in the morning it remained sunny so far. 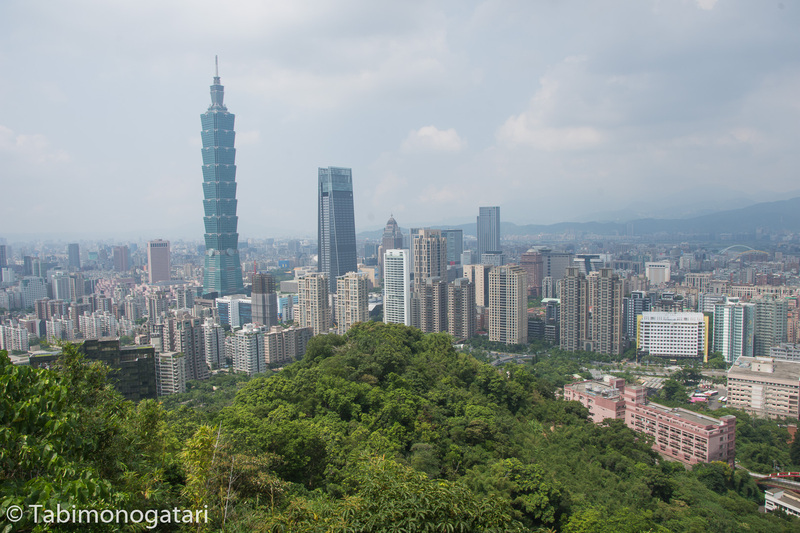 Hoping to stay dry I chose to hike up the Elephant Mountain in the East of Taipei next. 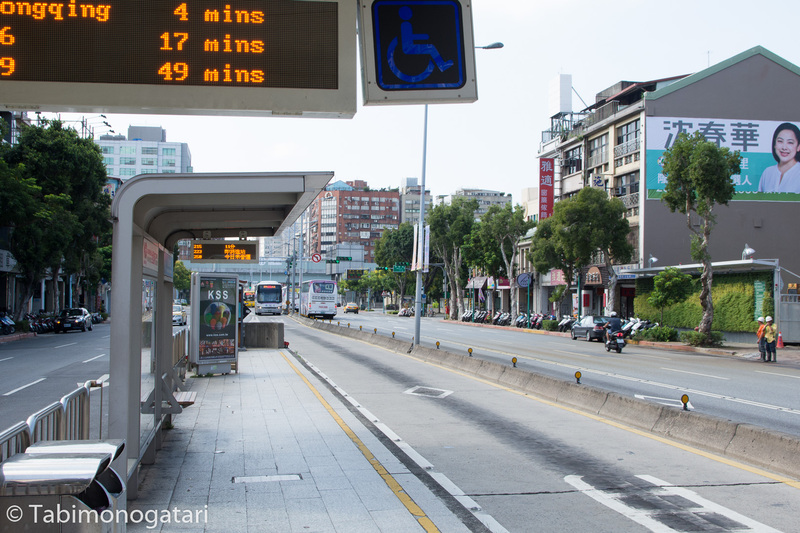 Taking the bus in Taipei is relatively simple, if you are prepared. Although the buses have numbers and English announcements, finding the correct route from a map is nearly impossible. Using Google Maps was incredible helpful in finding the fastest and often cheapest route. When boarding the bus one must check whether the fee has to be paid upon boarding or upon exiting. A sign in the bus indicated this, with 上 (up) meaning to pay in the beginning and 下 (down) at the end. In my experience it was paying upon exiting most of the time. Also, using an IC card (here it’s called Easy Card) is the only sensible way to pay on a bus. On the way to the trail I passed through a residential area and there was a street stall offering pastries. Of course I had to try one, with a red bean and egg yolk filling it was irresistibly delicious. The hike was quite demanding in this humid weather and I found myself sweating a lot after a while. 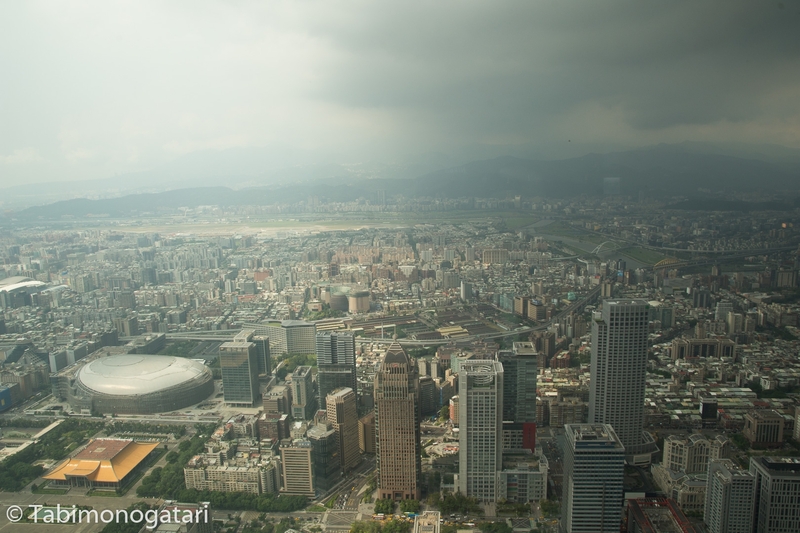 After half an hour I was rewarded with a view over the city, including the Taipei 101 skyscraper, currently the 10th highest in the world, although it used to be the highest until 2007. The unique shape used follows many Chinese design philosophies, to example the number 8 was incorporated in many ways. 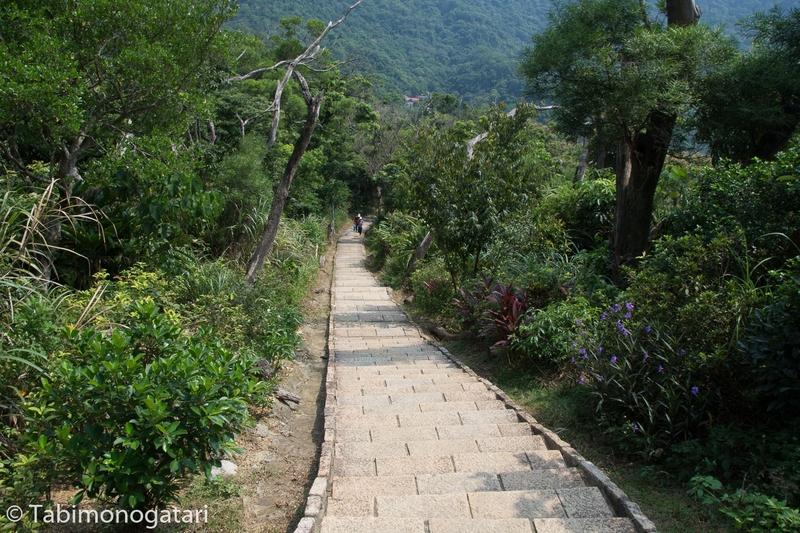 Along the trail there were many plants local to Taiwan and once a black butterfly flew by. 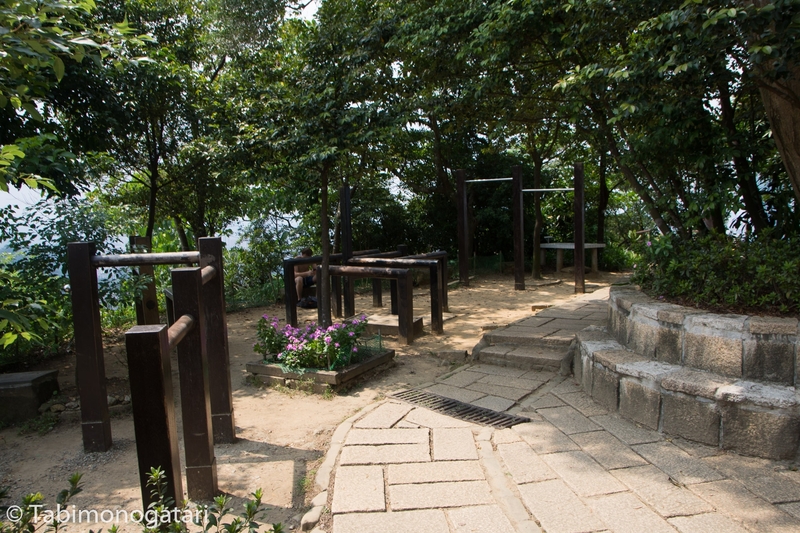 Next to the sightseeing point there was a little fitness park that left me wondering who had the strength to exercise after such an exhaustive hike. Satisfied with the view, I turned around at the plateau to reach even higher up. 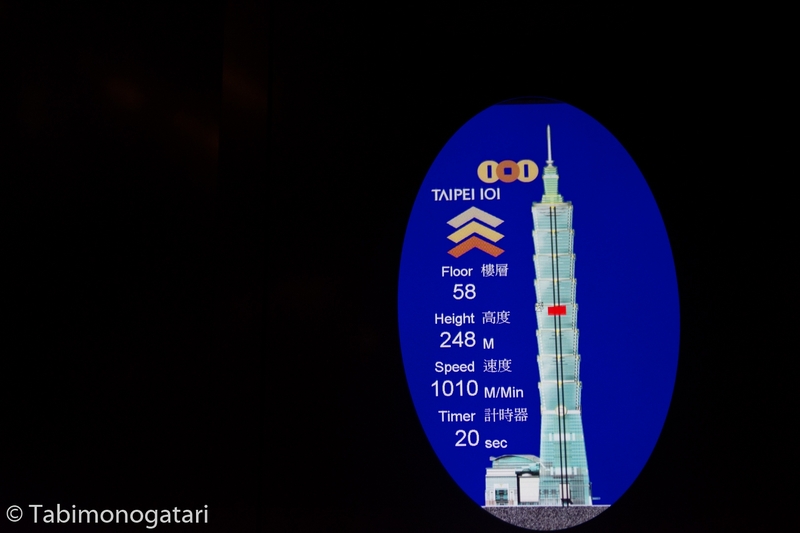 The Taipei 101 building has set several records, apart from its height. For once, the elevators going up to the observation floor on the 91th floor are the second fastest in the world with 1010 m/min (60 km/h). 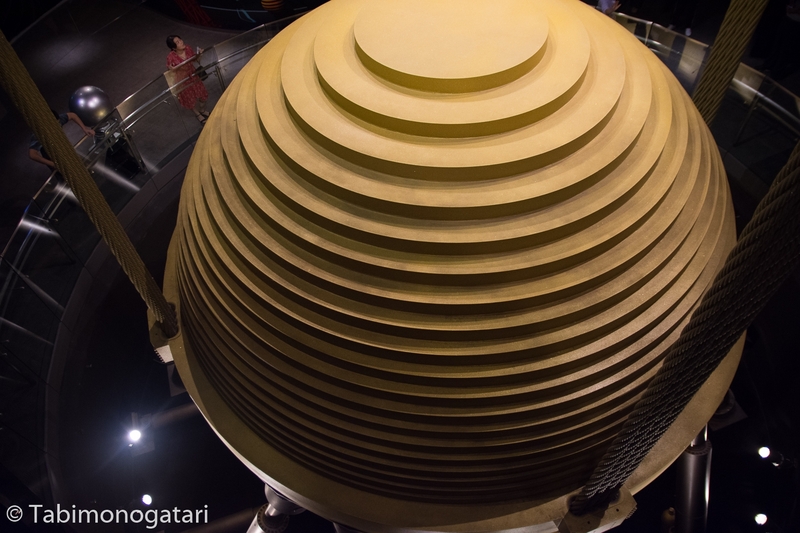 Moreover, at the top there is a massive steel sphere that acts as a wind damper to ensure the tower does not sway during extreme weather or earthquake. 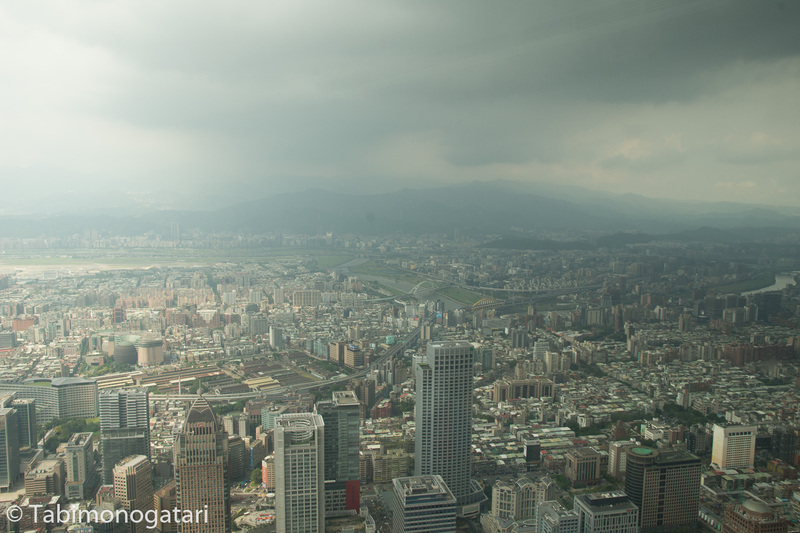 The elevators were incredible fast, because the ascend of 400 meters happened in an instant. The view from up there was glorious, but it was a bit hazy. Still, one could see as far as the city borders. 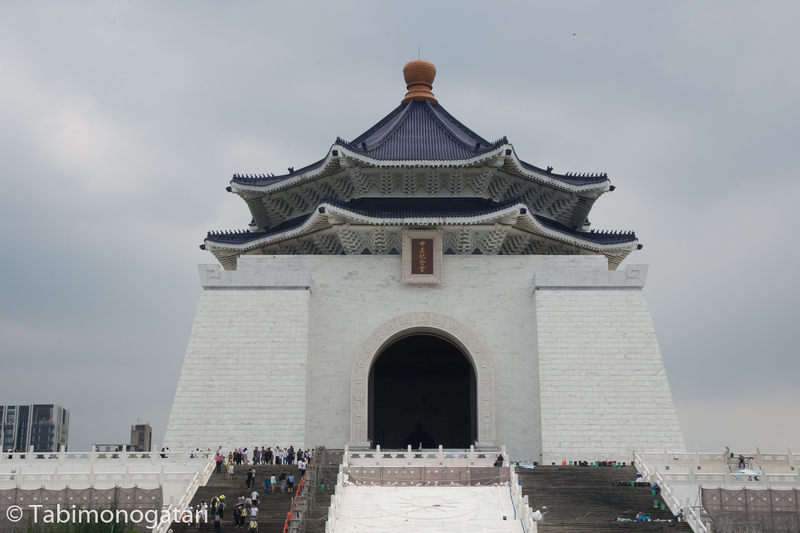 The 700 ton heavy free-hanging wind damper could be inspected as well. A video recording showed it swaying during a typhoon a few years ago that made me think of the incredible force winds have. Of course the wind damper received its own mascots. 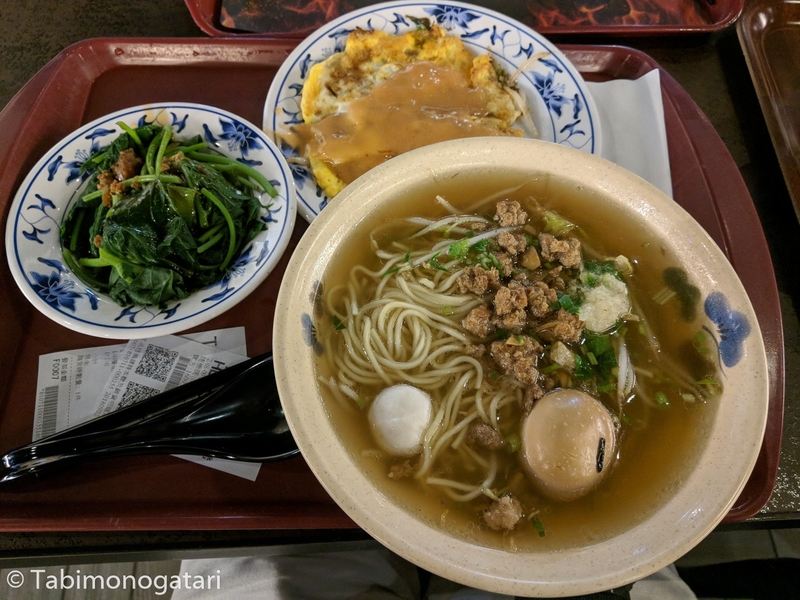 Back on the ground, I took a stroll through the integrated shopping mall and tried beef noodles, another Taiwan classic, in the food court. 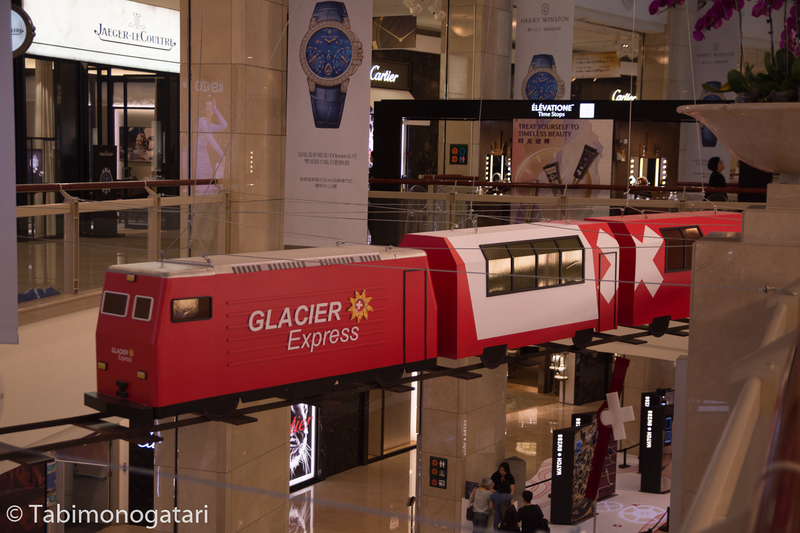 Funnily, the Swiss tourism board hosted a promotion campaign throughout the mall, complete with videos, interactive content and a model of the Glacier Express train. 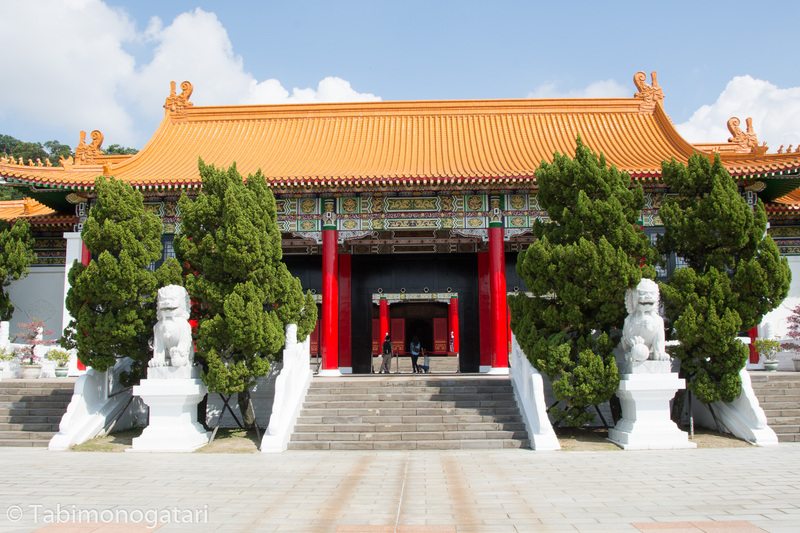 The next stop on my list was the National Palace Museum that hosts a large collection of Chinese treasures. I read their collection is so valuable that they only exhibit one percent of it at a time. In the evening the hostel hosted a barbeque party on the roof top, so I made sure to attend it in lieu of another street food trip. There I met locals, travelers and expats living here. On the last day I asked the hostel staff for a good place to try a local breakfast and they recommended a nearby place. 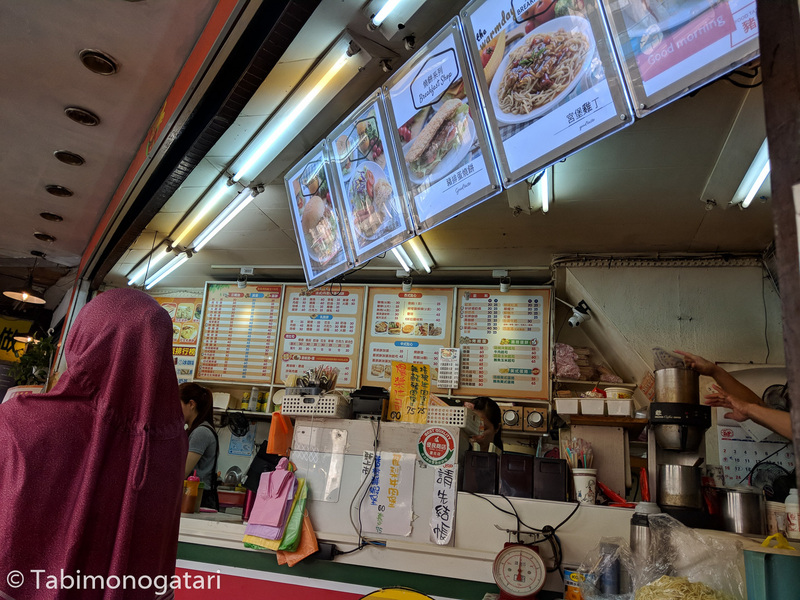 There were various dishes on the menu and according to Wikitravel there are many different choices for local dishes, including both Chinese and seemingly Western influenced ones. Pointing at the menu without knowing what I would get, I hoped for the best. I took a seat and was served a cold sweet black tea shortly after by the waitress. 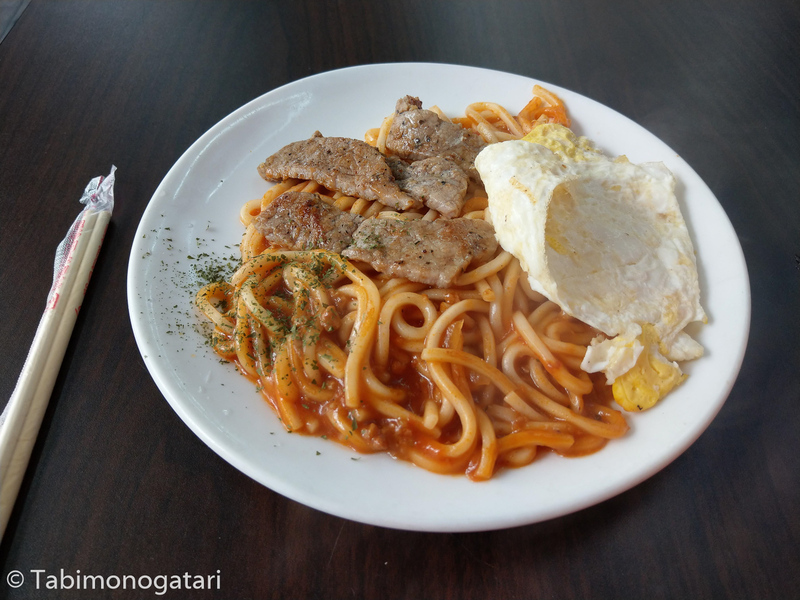 The dish I ordered turned out to be noodles with tomato sauce and beef slices and while it seemed to be familiar to the Italian version first, it had a distinctly different flavor. Thanks to Google Maps, I found that the fastest route to the National Revolutionary Martyrs’ Shrine was using the bus again. 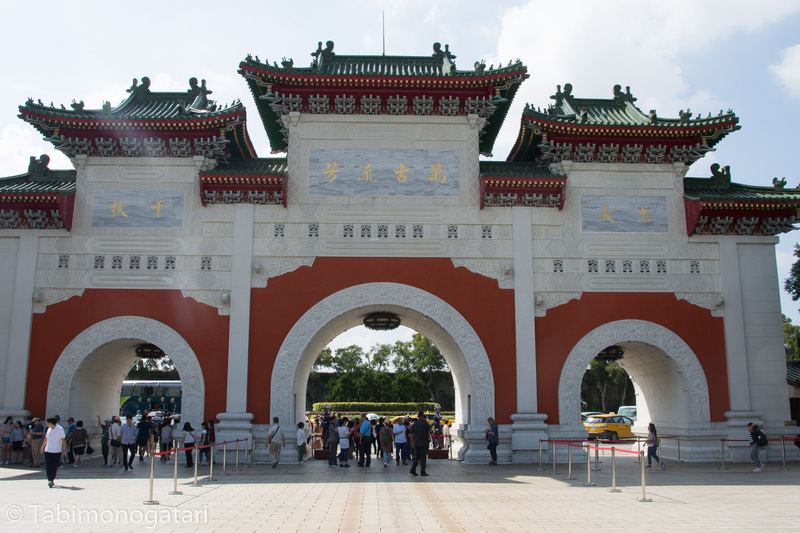 The shrine was erected to remember the lost soldiers of China during war. The architecture of the gate and the main building was impressing, but unfortunately the inside could not be visited that day. 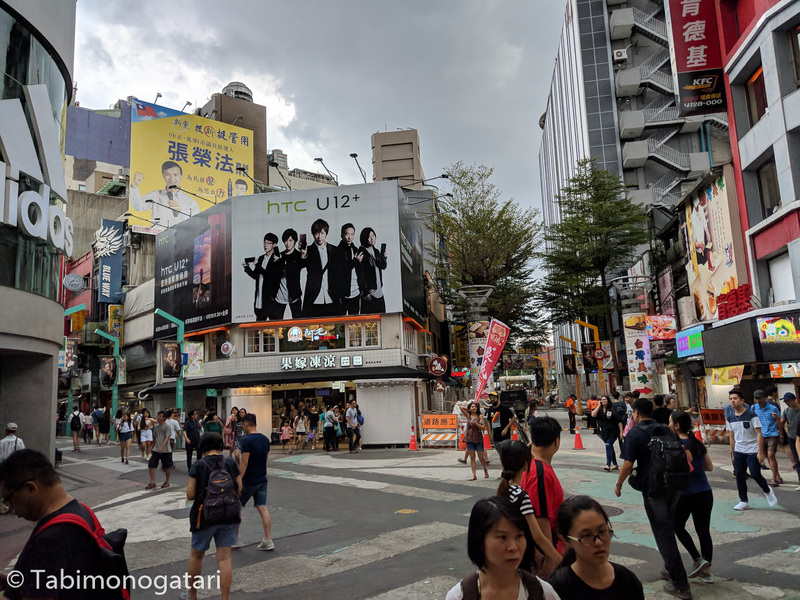 Southwest of the main station is the Ximending district, which is sometimes referred to as Taipei’s Harajuku. 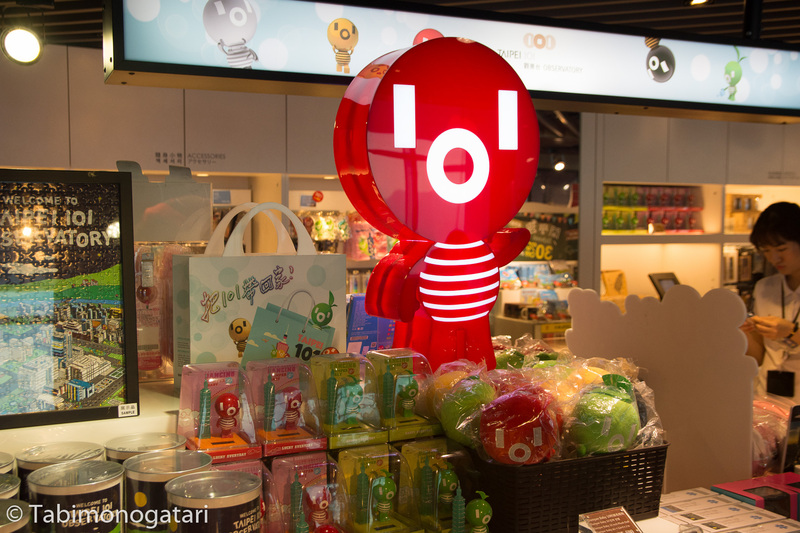 The name comes from the young clientel and the countless Japanese shops and restaurants that can be found here. Strolling around I came across the Red House building where craftsmen offered some of their creations. One shop sold flattened glass bottles for decoration, a creative and not common idea. I purchased a bottle and will show you a picture later. For lunch I visited a familiar chain, that being CoCo Ichiban Curry. I am fond of their Japanese curries that can be adjusted in size and spiciness but did not find time to enjoy it while being in Japan. You can never fare wrong with their katsu curry, spiciness level 3 was not too spicy I found. When I left, a torrential rain set in and since I did not have time to wait it out I ran to the next station. At the hostel I picked up my suitcase and left for the airport. I spent the last Taiwan Dollars on Pineapple cakes, a local specialty and made it just in time to the airplane before they shut the door. 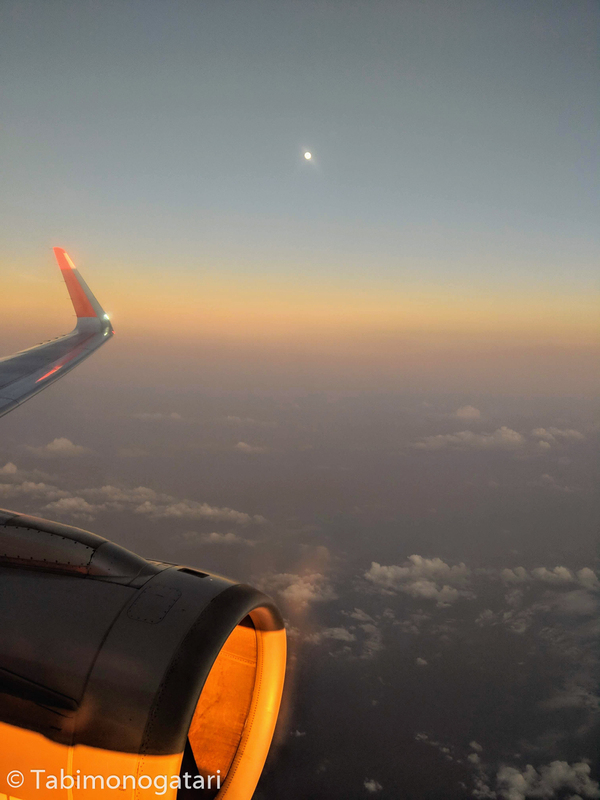 The last inter-Asia flight brought me back to the beginning of the trip. In Singapore I will spend another two days before flying home.